Before going to Central Park, where he makes bubbles for tips for a living, Nathan Freeman sits on a bench as a group of curious tourists pass by on the morning of Tuesday, August 12, 2014, at Columbus Circle. Freeman, who does not have a permanent home, spent the previous night on the steps of the Columbus monument. Photo by Leif Reigstad. An African vendor showcases his accessories on 125th street outside of the Apollo Theater in Harlem, NY, on Thursday, August 7, 2014. Photo by Mikayla Vielot. A woman takes a cigarette break while speaking on the phone in the garment district on Thursday, August 14th, 2014. Photo by Tal Trachtman Alroy. An NYPD officer Serrano and a Rockefeller Center security guard Conald Pierre socialize just outside the British Empire Building in New York City on Wednesday, August 13, 2014. Photo by Saif Alnuweiri. A woman sits with her younger neighbors on footstep of her apartment on West 136th St. in Hamilton Heights, New York City on Sunday, August 24, 2014. Photo by Mohamad Yaghi. Women sit in front of a bodega eating mangoes at W. 173rd and Amsterdam Avenue in Washington Heights, NY, on Thursday, August 7th, 2014. Photo by George Steptoe. Eon Okami, 23, sells comic books in front of the Bronx Criminal Courts in New York City. Photo by Justine Calma. Angel P., 22, on Madison Street in Ridgewood, Queens, NY on Sunday, August 24, 2014, where he works as a car washer. “We do this everyday, wash cars, repair them, paint rims, smoke, drink; everything,” Angel said. Photo by Antoine Goldet. A woman waits for someone to help carry her groceries in Jackson Heights, Queens on Wednesday, August 13, 2014. Photo by Myra Iqbal. A woman passes in front of a store in Washington Heights on Broadway and 161st Street on the morning of Saturday, August 23, 2014. Photo by Asthaa Chaturvedi. A hair dresser looks out of the window of the salon where she works in Washington Heights, NYC, on Saturday, August 23, 2014. Photo by Asthaa Chaturvedi. Just outside a basketball court on West 112th Street in Harlem, a young couple shares a romantic moment on Wednesday, August 6, 2014. Photo by Olivia Lace-Evans. A youth from the Bronx, New York, makes a slam dunk in his makeshift basketball hoop in the mid-afternoon heat on Wednesday, August 13, 2014. Photo by Emily Palmer. An elderly woman has a conversation with her dog, overlooking a Bronx street on Wednesday, August 13, 2014. Photo by Emily Palmer. 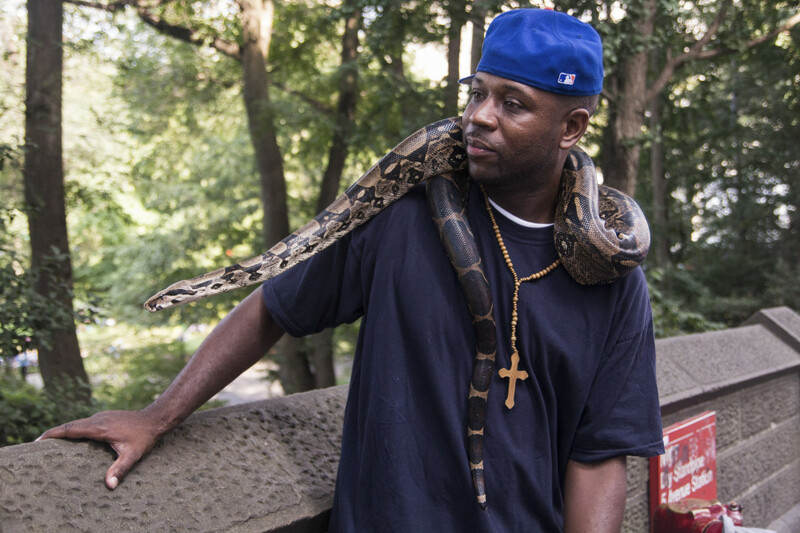 Yorel ‘Exile Child’ Oheem and his boa constrictor on West 59th Street, New York City on Thursday, August 21, 2014. Photo by Liz Lucking. A dog takes itself for a walk in the West Village of New York City on Wednesday, August 13, 2014. Photo by Jacqueline Williams. Barbara Lorber shares her ice cream cone with a friend in NYC’s the West Village on Sunday, August 24, 2014. Photo by Jack Crosbie. Zeus the cat isn’t a particularly helpful gardener in the West Village, NYC, on Sunday, August 24, 2014. Photo by Jack Crosbie. Brooklyn, 9, Remy, 7 and Alfie, 3 play in the back garden of their new home in East Williamsburg, Brooklyn, New York on Saturday, August 9, 2014. Photo by Chloe Mamelok. Lloyd McNeill, 89, getting lunch at Pepe Rosso Social, one of his usual spots in New York City on Monday, August 25, 2014. Photo by Alina Abouelenin. Emily Hope Price, cellist in the band “Pearl and the Beard,” composes a song for the anniversary of her friend’s death at her apartment in Bedford-Stuyvesant, Brooklyn on Thursday, August 7, 2014. Photo by Chloe Mamelok. Israel Martinez demonstrates a salsa move during a dance rehearsal at his studio in Long Island City, Queens, on Wednesday, August 13, 2014. Photo by Meridith McGraw. Jessica Chrustic, an urban beekeeper, relaxes with her cat just after the adrenaline rush of inspecting the hive in her backyard on Thursday, August 7, 2014. She pauses in front of a family photo gallery wall in her home in the Bedford-Stuyvesant neighborhood of Brooklyn, New York. Photo by Maya Albanese. After Beetle Bum the Magic Clown’s show, children wait to eat a birthday cake in a Brooklyn home in New York, on Sunday, August 12, 2014. Photo by Miriana Palau. A fabric salesman, originally from India, at the B.K. store in the Garment District in New York City on Thursday, August 14, 2014. Photo by Tal Trachtman Alroy. Russel, 32, takes a break from his shift at the Kabab King restaurant to eat in Jackson Heights, New York on Wednesday, August 13, 2014. Photo by Myra Iqbal. A commuter at the Utica Avenue train stop walks past a police advertisement requesting information about a homicide in the Bed-Stuy neighborhood of Brooklyn on Thursday, August 14th, 2014. Photo by Lonna Dawson. Utilizing subway time: Isamar Jimenez freshens up on the subway at 96 Street before meeting her boyfriend at the movies on Monday night, August 19, 2014. Photo by Jenny Luna. Adrian Michna looks out at Coney Island, New York, from the F train on Saturday, August 9, 2014. Photo by Gautham Thomas. Commuting on a mini motorcycle: Lexington and Martin Luther King Blvd., East Harlem on Wednesday, August 6, 2014. Photo by George Steptoe. Richard Powers, transformed into Beetle Bum the Magic Clown, walks down Fort Hamilton Parkway in Brooklyn, New York, on Sunday, August 12, 2014, on his way to entertain children attending a nearby party. Photo by Miriana Palau. A woman walks past New York Criminal Court in Chinatown, New York City, on Wednesday, August 6, 2014. Photo by Tess Owen. Marqui, a.k.a. “Andy LaSalle,” walks on a bench near a playground at the General Ulysses S. Grant Houses in Harlem, on Thursday, August 7, 2014. He says it’s a concentration exercise he does often. Photo by Leif Reigstad. Carlos Konig, 48, plays “Twinkle Twinkle Little Star” for 20-month-old twins Michiho, left, and Michiya, right, along with their mother, Rieko, in Central Park in New York City, on Saturday, August 23, 2014. Photo by David Ok.
A young man looks at his phone at the intersection of 116th Street and Malcolm X Boulevard in Harlem on Friday, August 22, 2014. Photo by Miriam Sitz. Alberto Jose “A.J.” Pichardo at work at Katz’s Delicatessen in New York City on Thursday, August 14. Photo by Alanna Weissman. Two local residents joke around on Nostrand Avenue in Crown Heights, New York City, on Saturday, August 9, 2014. Photo by Tess Owen. Peter Allen, 20, spends his day visiting friends in the Hunts Point section of the South Bronx on Thursday, August 28, 2014. Photo by Benjamin Bergmann. Sikandar Khan, 64, relaxes in the square near his local mosque before the next prayers at Jackson Heights, Queens on Friday, August 15, 2014. Photo by Myra Iqbal. Robert Leslie, a 23-year-old musician who has built a following from subway performances, plays at Karma Bar in lower Manhattan on Thursday, August 14, 2014. Photo by Isabelle Muge Niu. A woman sits outside her shop in Chinatown, New York City, on Saturday, August 9, 2014. Photo by Emily Silber. A group of elderly people play a board game and chat late at night near Hester Street Playground in Chinatown in New York City on Thursday, August 7, 2014. Photo by Darwin Chan. Right to left: Friends Joshua Walton, 35, Tenzin Woiser, 22, and Pedro Velez, 28, celebrate after Woiser took the ALS ice bucket challenge on the rooftop of Walton’s apartment in Manhattan’s Lower East Side, New York, on Thursday, August 21, 2014. Photo by Shivam Saini. The 2015 class at Columbia Journalism School just survived what was, for most of them, their first training in photojournalism & DSLRs. Though it was difficult, they produced work that's thoughtful and engaging. We talked to some of the students whose work we’re featuring here, and asked them about their first experiences photographing New York without smartphones.